Department of Economics, Soochow University, No. 56, Section 1, Kueiyang Street, Chungcheng District, Taipei City 100, Taiwan. *To whom correspondence should be addressed. E-mail: 0928chudavid@gmail.com. Received 24 January, 2018; Received in revised form 17 June, 2018; Accepted 25 June, 2018. Fruit fly optimization algorithm, Financial crisis prediction, Back propagation network, Logit regression. The early warning of financial crisis is a great concern to scholars and experts. Economists have been trying to use various econometric models to do related research and gain many concrete achievements. At the same time, artificial intelligence experts have joined the discussion. In this paper, we will use a new technique of artificial intelligence, called the fruit fly optimization algorithm (FOA), which combines the support vector regression (SVR) and generalized regression neural network (GRNN) to create new financial crisis prediction models, with the hope that it will be useful for academia and practitioners. 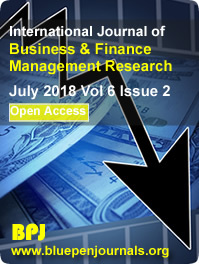 In addition to the traditional methods of artificial intelligence - back propagation network (BPN) and GRNN, this study also constructed the financial crisis warning models of FOAGRNN and FOASVR respectively, and compared them with the traditional Logit Regression model. The empirical results obtained show that the performance of prediction by all the financial crisis models is good, specifically, FOASVR model is the best, followed by FOAGRNN and BPN, and the last is Logit Regression. Therefore, this study has found out that the use of FOA combined with other artificial intelligence models (SVR and GRNN) is helpful to improve the performance of financial crisis early warning.